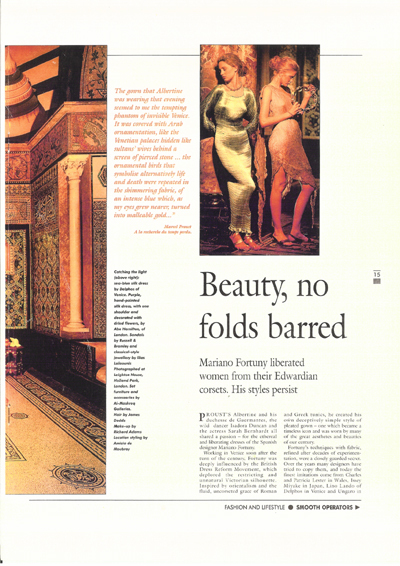 Proust’s Albertine and his duchesse de Guermantes, the wild dancer Isadora Duncan and the actress Sarah Bernhardt all shared a passion – for the ethereal and liberating dresses of the Spanish designer Mariano Fortuny. Working in Venice soon after the turn of the century, Fortuny was deeply influenced by the British Dress Reform Movement, which deplored the restricting and unnatural Victorian silhouette. Inspired by the orientalism and the fluid, uncorseted grace of Roman and Greek tunics, he created his own deceptively simple style of pleated gown – one which became a timeless icon and was worn by many of the great aesthetes and beauties of our century. Fortuny’s techniques with fabric, refined after decades of experimentation, were a closely guarded secret. Over the years many designers have tried to copy them, and today the finest imitations come from Charles and Patricia Lester in Wales, Issey Miyake in Japan, Lino Lando of Delphos in Venice and Ungaro in Paris. This autumn, too, the British chain Marks & Spencer has brought out an affordable range of pleated underwear. In pleated silk or velvet, Fortuny-inspired dresses give their wearers majesty and beauty. But they are also comfortable, on the basis that it is hard to look or feel beautiful if you are constricted. A woman who goes to a dance in high heels and pinching satins and silks can feel trussed up and pompous. The look takes not only its shapes but also its colours from the natural world. From nature come the soft shades – the musky pinks of dead flowers and the rusts of corrugated country sheds – and the vibrant tones, the stronger purples, or the searing blue of lapis lazuli. A metre of fabric takes eight or more hours to pleat, dye and bake. 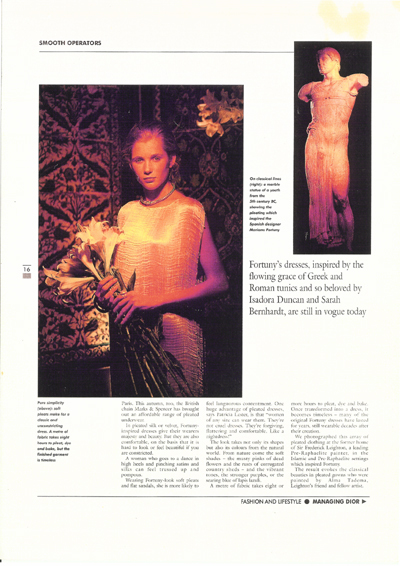 Once transformed into a dress, it becomes timeless – many of the original Fortuny dresses have lasted for years, still wearable decades after their creation. 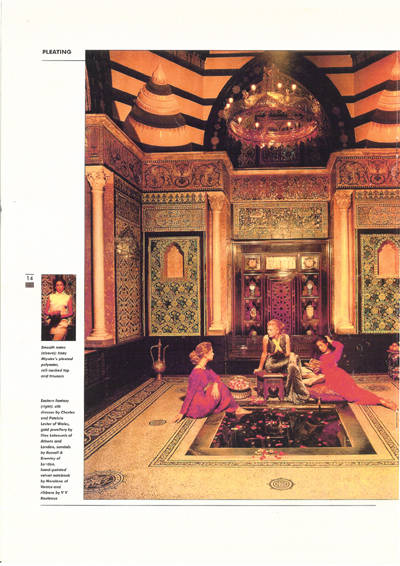 We photographed this array of pleated clothing at the former home of Sir Frederick Leighton, a leading Pre-Raphaelite painter, in the Islamic and Pre-Raphaelite settings which inspired Fortuny. The result evokes the classical beauties in pleated gowns who were painted by Alma Tadema, Leighton’s friend and fellow artist.